WW update: another pound off. Whoopeeee! 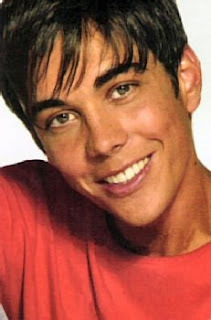 Spanish boyband NASH (pictured above) have had to change their name. Due to their name being terribly close to another copyrighted name, the boys have taken the earthshattering decision to change their name to (drum roll.........).................D'NASH ! Why? Not since those legendary yawn merchants Pondlife, I mean Westlife, changed their name from the infinitely-cooler-tribute-to-Ali-G, Westside, has the world of the boyband seen such a duff name change. D'NASH ? D'OH! Oh well, what's in a name - it hasn't changed anything. 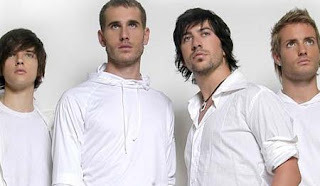 They will still be carrying the hopes of España to this year's Eurovision Song Contest (and will doubtlessly flop); I still fancy the dark haired one with the facial fuzz; and the blonde one is still sooooooo g*y. Finally a decent song in the top 20. After being around for what seems like months now, Superbus' "Butterfly" has finally gone straight in at no. 11 and brings some much needed fresh new music to the chart. Liking "Elles Demandent" by Medhy Custos which has a real summer sound to it. Not much else happening this week: Fatal Bazooka still no. 1 (why??) and the dreaded Cascada this week's highest new entry. The French gossip mags report that Star Academy 4 winner Gregory Lemarchal has announced that he's quitting music ..... for a year. He's decided to take time out after what's been an overall disappointing career to date. 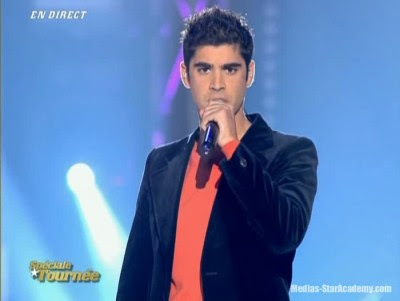 Where previous winners Jenifer, Nolwenn and to a lesser extent Elodie have continued to enjoy success, the young man from Chambery hasn't set the French charts alight although his recent duet with Lucie Silvas "Meme Si" did well and got tons of airplay. His fortunes are nearer to those of his successor Magalie Vae who was last seen signing copies of her recent flop single in a supermarket. Recently Gregory has become more known for his fling/relationship/publicity stunt (ALLEGEDLY !!!) with TV personality Karine, of which the French gossip mags have been sceptical to say the least. In a way I always thought of him as the French Gareth Gates: got famous thanks to sympathy votes on a TV talent show but whose hitmaking career was short-lived. We wish Gregory well and hope that he bounces back with some new material worth listening to. Not that we need a reason, but it's relevant this time as I'm continuing to ask the big burning questions about Prison Break that no-one can answer. Such as: whatever happened to Michael's cream suit? Where are everyone's clothes coming from? And when is Linc going to take off that shirt?? ...after one of those days at work which couldn't end quickly enough, I started imagining how different it would be if I could be reinvented as one of the characters in "Heroes" which is possibly my 2nd most fave show of the week, just behind "Prison Break". Can't decide whether I would want to squeeze my eyes shut and stop time like Hiro, turn completely bonkers-nasty like Niki/Jessica, read minds like Matt or maybe just fly like Nathan and Peter. In the end I settled for being Claire the cheerleader - she gets everything thrown at her and stays indestructible. Sounds familiar after a day like today!! Countdown to Stockers: 6 weeks to go!! Anyway am now thinking about all the things I want to do ..... visit Skansen and get our first moose sighting in 11 years, go a boat trip round the city archipelago, discover if there is life beyond "dagens rätt" and get an affordable meal at night, and of course discover the record shops. In the words of the great philosopher Freddie Mercury (or McFly if you are that way inclined) - "Don't Stop Me Now"!!! Not that we need a reason...! 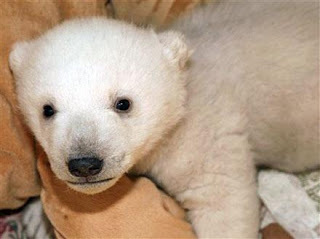 If Berlin Zoo doesn't want this little baby polar bear cub, we'll take him! Season 1 (cast pictured above) was one of last year's hottest TV shows - even if Channel 4 didn't think so, judging by its very late night slot - but now we hear that Season 2 is on its way to our screens and according to sources will be shown on FX from 15th May onwards. Stuff I like on the telly! Prison Break (five, Mondays): continues to be addictive and irresistible viewing. Will they get away? Why is T-bag so disgusting and entertaining at the same time? When will Lincoln take his shirt off? 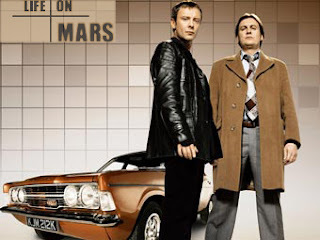 Life On Mars (BBC1, Tuesdays): Enjoyable stuff, particularly for those of us who were in the 70s first time round. Heroes (Sci-Fi, Mondays): Can't miss an episode, it's so addictive. Hiro is hilarious and Mohinder is hot! 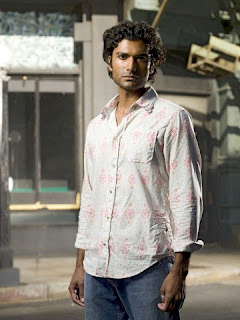 We want more Mohinder! 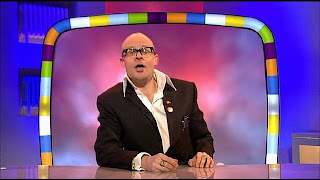 Harry Hill's TV Burp (ITV, Saturdays): there will be a void in my Saturday night when this ends. A true "TV highlight of the week". TV4's "Let's Dance" will soon have a new champion dance pair and it will be either Martin/Cecilia or Tobbe/Annika. The show said goodbye to Erica/Daniel this week. After watching both couples dance I would have to choose TV presenter Tobbe, who looks more relaxed on the dancefloor than his rival, wrestler Martin who still looks too serious and self-conscious at times. Also this week, series 1 winner Mans Zelmerlow returned to the show but this time not to dance, but to sing "Cara Mia" which is now no.2 in the Swedish singles charts behind "The Worrying Kind" by The Ark. After last night's BBC3 countdown of the most irritating songs (many of which I actually like, it's all a matter of taste), I decided to think about just what is the worst song of all time, and drew a blank until 5 minutes ago, when one of my favourite French radio stations Kiss FM (www.kissfm.cc) played "No Bravery" by James Blunt. We have a result!! Star Academy 6: The Tour - without Gael!! The lovely Gael Garcia (above) who controversially quit last year's Star Academy is not among the final 7 contestants in last year's 6th series of Star Academy, who have hit the road for a lengthy tour of France and other French-speaking countries. Not that we need any excuse to print a photo of him!! Early reviews suggest that the tour is going to be a big hit. Cyril, Dominique, Ludovic, Cynthia, Brice, Marina and Jean-Charles are the lucky seven to make the tour and will at least prolong their 15 minutes of fame. All is quiet on the CD front and it looks as if winner Cyril will not be rushing into making his first album. Whether this will be a smart strategy or not, only time will tell. Nicolas Charvillat continues gigging and has his own Myspace, which I'll continue to check for any info. The CMONS are fantastic and they have achieved the impossible as they have made car advertising worth watching. Visit www.thecmons.co.uk and you will see the legends in action, along with lots of interactive fun. What Goes Around - Justin Timberlake: Or, "Cry Me A River - The Sequel". Classy ode to a break-up. Som Om Himlen Brann - Lizette & Bizazz: flashback to 1992. Forget that Christer Bjorkman ever existed! Sjunde Himlen - Lena Palsson : principal boy chic meets early 1990s key-change schlager, from 1993. Here - Christina Undhjem - also-ran at MGP but big this week at EC HQ. Destination Calabria - Alex Gaudino: what do you get when you mix Crystal Waters with a Pigbag-esque sax refrain? Dance heaven. 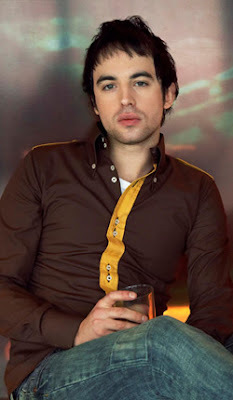 See What I See - Dima Bilan: Quality Russian pop. What Have You Done - Within Temptation: Don't call them Evanescence clones. Will this be the one that finally brings UK success to the Dutch rockers? New Shoes - Paolo Nutini: Am I becoming a fan? That’s two of his songs I’ve liked now. The Sweet Escape - Gwen Stefani: whoo-hoo, yee-hoo. Addictive pop tune which I strangely quite like. Starlight - Muse: their best song ever, and still worth a listen after all these months. Not been around here much this week due to a combination of a heavy cold and the small matter of wallpapering our new kitchen at EC HQ. Mission accomplished and feeling very happy with the end result. Countdown to Stockers: 7 weeks to go! 7 weeks from today I will be in Stockholm with my faithful travelling companion, and the results will be appearing at a blog near you! The Ark. Sebastian. Mans Zelmerlow. Sonya Alden. Andreas Johnson. Marie Lindberg. Sarah Dawn Finer. And that's just the top 7. They've gone Melodifestivalen Mad!!!!!! And we love it. DJ Otzi of Hey Baby fame is back at the top of the German charts. Despite their failure to represent Germany at Eurovision, Popstars winners Monrose are also doing very well with "Even Heaven Cries". German chart regulars Christina Sturmer, Silbermond and Herbert Gronemeyer also appear in this week's top 20. Fans of German pop shouldn't miss DW-TV's "Pop Xport" a very informative fortnightly weekend music round-up. Open bottle. Fill glass and drink every time host Markus mentions Tokio Hotel. I guarantee that bottle will be empty by end of the show!! Did I mention Tokio Hotel? Not only are they superstars in their native Germany but they are now taking France by storm. Couldn't resist watching NRK's "Melodi Grand Prix" which is still on the NRK website along with all the semi finals. Brilliantly staged and great presenters too. Stian Barsnes Simonsen is so sweet and funny and I don't know a word of Norwegian but hey who cares? Stian, you have been inducted into the EuropeCrazy Hot Guys Hall of Fame (Cute Norwegians Section). I don't get Michael Youn. Obviously the French do though, as the comedian is once again at the top of the French singles charts with "Mauvaise Foi Nocturne" by his spoof rap combo Fatal Bazooka. The French top 20 continues to be filled with kiddie-pop and novelty singles - this week's crop includes Bebe Lilly and Sebasto, now all we need is Ilona Mitrecey to complete the set. No, let's not. There are some good French-language singles at the moment: Thierry Amiel's electro-flavoured "Coeur Sacre", Shy'm's "Victoire" and, well, that's about it. Things can (and must) only get better. So, BBC: what have you to say about the Making Your Mind Up result fiasco? It's snowing today. British Summer Time begins next weekend. Rugby star Kyran Bracken won the second "Dancing on Ice". Initially I wasn't a fan but after his fab Jacko routine from last week he won me over. We at EuropeCrazy HQ were supporting Duncan James of course but had to admit that Duncan didn't put enough content into his programmes in the latter weeks compared to Kyran. What we were glad about was Clare Buckfield not winning. She was this season's answer to Bonnie Langford, spending more time in the air than on the ice. Maybe next year they could have "(Not Much) Dancing On Ice (But Getting Lifted A Lot)". TV Highlight of the Week!! WHERE DID HUNKALICIOUS BIG BROTHER LINCOLN GET THAT SUNTAN? Did Fox River Penitentiary have its very own sunbed? Or did he pop into Tan Canaria in between digging for missing millions and going off to get LJ? We must be told! There is no end to the craze of musicals build around artists and here is yet another one, "Never Forget" based on the music of Take That. Only thing is, Take That don't want anything to do with it. Whether they will be saying that when the royalties from the show come in is another matter. Don't get me wrong, I love TT and won't hear a word against them, but they should be cashing in at every opportunity rather than turning their back on a nice little earner. Also, am I the only one to notice the similarity of "Shine" to Andreas Johnson's MF runner up "Sing For Me"? Sebastian's new CD is out! Will post review once I get the CD. 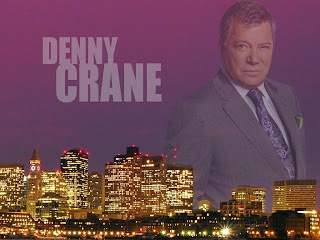 Now off to YouTube to watch his MF2007 final performance of "When The Night Comes Falling" which someone has kindly posted. Making Your Mind Up? Making whose mind up? There is something rotten in the state of Royaume-Uni if this is what will represent us at the Eurovision Song Contest. Not in my name it won't. Nor it seems in the names of all those other viewers and voters who would appear to have chosen Cyndi's song as our entry. Even Lord Terence of Wogan, whose performance last night suggests an icon well past his use-by date, announced Cyndi as the winner in the most embarrassing results announcement since that of the 2003 Song for Europe which sent Jemini into eternal damnation in Riga. The schlager-hell of "Flying The Flag" isn't even so bad it's good. It's so bad it's bad. 1. Pomme C - a dramatic opening, Calo's vocals almost operatic here on the chorus. 2. Le Saut de L'Ange - first single, safe choice although lacks the memorable hooks of such classics as "Yalla" and "Face A La Mer". 3. Game Over - an English title for a French song with an electronic rock beat. 4. Suis-Je Assez Clair? - Maximum dramatic vocals. Fans of Keane would also enjoy the music of Calogero as he has a similar soaring voice to Tom Chaplin. 5. Drole D'Animal - slowing down the pace here, another pleasant number. 6. Me Dit-Elle - Calo rocking out again on this one. The whole feel of the album is more rocky and might take a wee bit more getting used to, but it's hard to tell on only 30 second clips. 7. Sans L'Amour - The heavier sound continues here. 8. Danser Encore - He is taking more chances vocally here, although it's a little cheesy with its waltzing rhythm. 9. Melodies En Sous-Sol - Yet more chiming guitars and pianos again. He's definitely been listening to Keane!! 10. Je Sais - Acoustic flavoured slowie and deliciously sensitive vocals. Really want to hear this one all the way through. 11. Hypocondriaque - A big anthemic finish, the backing track reminds me of ELO !! I will post a full review when the CD arrives at EuropeCrazy HQ. Calogero's music generally doesn't always grab you on first hearing and you need to hear some of his songs a few times but I guarantee you will be well rewarded for your patience. Congratulations to The Ark who won Melodifestivalen in Sweden last night. Thanks to broadband it was my first ever chance to watch MF on the web and it was brilliantly staged by SVT. (Watch and learn, BBC). Although Kristian Luuk struck me as being a little pompous at times, he appeared to be a good presenter who held it all together well. Nice leather suit Andreas, even if you're not as hot looking as you used to be when "Glorious" was out. A thought struck me during this one - you could imagine the late great Roy Orbison singing this nostalgic number. Plagiarism watch: See if you can get through it without thinking of "that's the story of/that's the glory of love" however we can forgive Mr Johnson anything. In the absence of Dame Shirley Clamp here was one of schlager's newest big hitters. She looked lovely and sang very well however it stopped short of showstopping. First OMG moment of the evening. Filling the hasbeen-position at MF normally reserved for Danielsson/Engberg, a joke's a joke but it ain't funny anymore. The fairytale story of the singing schoolteacher from the west coast wasn't destined for a happy ending, but she enjoyed every single moment nonetheless, even if the song was directionless. Plagiarism watch: not too obvious here but anyone getting "Ghetto Gospel" or that Lisa Loeb tune? Is it the glasses maybe? My love for this man is overwhelming my rational ability to pick out a good tune, but the song is very good as well. Wisely he has sacked his stylist and got shot of the red disaster of an outfit in favour of something more low key. Lovely lovely gorgeous man. I'm not into receding hairlines but Sebastian darling for you I make an exception. Love u loads!! Don't know how to do those little dots above the o and the little o above the a yet so apologies to Nordic readers. Anyway poor Mans was under the weather and for a man who foxtrotted and samba'd his way to "Let's Dance" glory he seems a little too static. Fredrik Kempe wrote this, wouldn't you know. The end is great though - Come! Close! Er! Cara-Cara Mia.... Fans favourite of course, but only 4th fave with me. Mr Past Glories of this year. "En Dag" was fabber than fab, this is just a cure for insomnia. How the hell did this make it to Globen? Little miss perfect with the most slappable face since Carola, yes it's that slappable. Dire, but if there is a place for schlager tonight then this would be it. Simple, Jill Johnson-styled performance which gave me goosebumps. If they want a ballad this is the one. Plagiarism watch: "The king of wishful thinking"
Joyful over the top tribute to 70s glam rock. Great fun although a little casual performance from Ola Salo which could have cost them the win. He needs to get his act together in time for Helsinki. And ditch the glittery chest heart thing. In the end the Ark won, both with the juries and televoters. Andreas was 2nd. Hooray! Well done Ola and the boys and good luck in Helsinki. 11 March 2007 - Welcome to EuropeCrazy! Hello and welcome to my blog. Why EuropeCrazy? The name of the blog says it all, as I'm crazy about European music, travel, sport, culture and everything else and I just want to tell the world about it! !